The Grey Phalarope at Elmley was a real bonus but equally good was the week before that I ventured into North Kent. As it would appear that most of the Little Auks have cleared out of the area now or succumbed to the local Raptors or Gulls, I thought I'd give an idea of waht the previous weekend was like. The last few weeks have been pretty good in North Kent, partly due to the weather conditions, not being at work all the weekends and some lucky breaks regarding choosing where to go birding. With reports of thousands of Little Auks 'up north' I decided along with John Tilbrook to bird the South side of the Swale adjacent to Conyer through to Oare on 11th Nov. Conyer appears to be little visited, yet is a great place to bird with a variety of habitats and more importantly, the possibility of a Little Auk !! Fortunately luck was on our side as within an hour of being on site and seeing Peregrine, several Marsh Harriers and waiting for tidal surge to be added to the list, a Little Auk whirred in from the west and dropped onto the Swale. Pleased with our quarry a second bird did the honours and flew past us and up the Swale towards Elmley................MEGA . A couple of small groups of Kittiwakes also flew up the Swale, 22 in total whilst a walk along the river wall overlooking Luddenham marshes revealed a stunning male Hen Harrier quartering the marshes . Next port of call was Oare via the scenic route that skirts along Luddenham marshes and towards Uplees. Very few birds of note along here toady bar a Little Owl calling, and a large flock of 50+ Fieldfare. 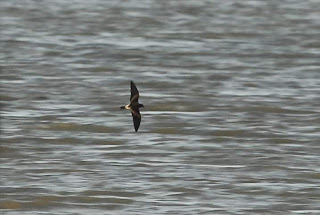 Once in position at Oare we ignored the flood to concentrate on the Swale once again. 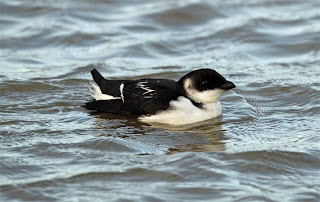 Incredibly within minutes of arrival John picked up a Little Auk slowly moving twards the shore and my camera!!! The bird is depicted here, a real cracker. 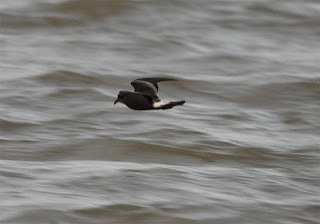 Things got better though with another 3 Little Auks located looking towards Harty Hill and then the icing on the cake, a superb Leach's Petrel that flew into view and remained albiet hidden at times in the Swale looking towards Harty. In flight the plumage features could easily be seen including the 'narrow' tube nose and the dark line that cuts across the centre of the tail. A cracking day out, the main quarry in the bag plus a few extras and finished off with a Barn Owl.